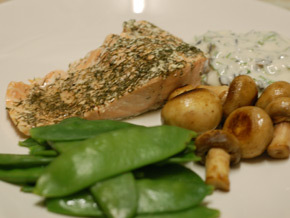 Not only is salmon a low GI food but it is also a rich source of omega-3, one of the good fats high in anti-oxidants. If you are concerned about the mercury deposits in salmon then consider only eating wild salmon, although this is much more expensive. 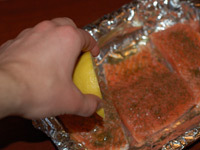 Line a tray suitable to go under the grill and place the salmon fillets in it. Cut the lemon and squeeze half of the juice over the salmon then sprinkle with half the dill. Place under a medium grill for 4 minutes then remove, turn over and coat the other side of the salmon with the rest of the lemon juice and dill. Cook under the grill for a further 4 minutes. 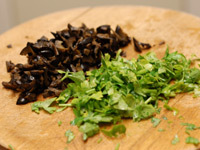 Whilst the salmon is cooking, chop the olives and the parsley into small pieces ready to be added to the yogurt. 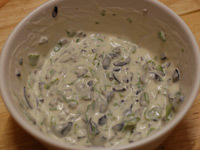 Mix the olives and parsley together with the yogurt and a pinch of salt and serve as an accompaniment for the salmon.